PORTAGE LA PRAIRIE, MAN. — Kaitlyn Lawes (Winnipeg) and John Morris (Canmore, Alta.) punched their tickets to Pyeongchang, South Korea, on Sunday after defeating Val Sweeting (Edmonton) and Brad Gushue (St. John’s) 8-6 in the 2018 Canad Inns Canadian Mixed Doubles Curling Trials final. PORTAGE LA PRAIRIE, MAN. — There will be a golden opportunity for three Olympic gold-medallists to make a return trip through the 2018 Canad Inns Canadian Mixed Doubles Curling Trials. PORTAGE LA PRAIRIE, MAN. — Brad Gushue (St. John’s) isn’t used to having someone throw the last rock for him. But Val Sweeting (Edmonton) has been doing just that for him this week and it’s earned them a spot in the 2018 Canad Inns Canadian Mixed Curling Trials final. PORTAGE LA PRAIRIE, MAN. 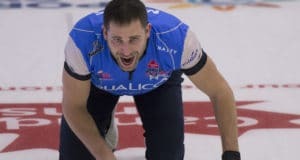 — Jocelyn Peterman (Calgary) and Brett Gallant (St. John’s) knocked off a pair of Olympians in the 3 vs. 4 Page playoff game at the Canad Inns Canadian Mixed Doubles Curling Trials to continue their pursuit of representing Canada in Pyeongchang, South Korea. PORTAGE LA PRAIRIE, MAN. — Brad Gushue (St. John’s) and Val Sweeting (Edmonton) along with John Morris (Canmore, Alta.) and Kaitlyn Lawes (Winnipeg) will play each other in the Page 1 vs. 2 playoff game after their victories at the 2018 Canad Inns Canadian Mixed Doubles Curling Trials on Friday evening. PORTAGE LA PRAIRIE, MAN. 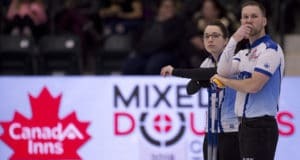 — Val Sweeting (Edmonton) and Brad Gushue (St. John’s) served Laura Crocker (Edmonton) and Geoff Walker (St. John’s) their first loss at the 2018 Canad Inns Canadian Mixed Doubles Curling Trials by a score of 7-4. PORTAGE LA PRAIRIE, MAN. — Chelsea Carey (Calgary) and Colin Hodgson (Winnipeg) were resilient in their extra-end tiebreaker victory against Nancy Martin (Saskatoon) and Catlin Schneider (Regina) at the 2018 Canad Inns Canadian Mixed Doubles Curling Trials. PORTAGE LA PRAIRIE, MAN. — When the dust settled on the final round-robin draw at the 2018 Canad Inn Canadian Mixed Doubles Curling Trials, seven teams felt relief after securing one of eight available playoff spots. PORTAGE LA PRAIRIE, MAN. — Laura Crocker (Edmonton) and Geoff Walker’s (St. John’s) Draw 16 victory was notable for a few reasons. PORTAGE LA PRAIRIE, MAN. — Laura Crocker (Edmonton) and Geoff Walker (St. John’s) remain unbeaten in Pool B at the 2018 Canad Inns Canadian Mixed Doubles Curling Trials and have clinched first in their pool by defeating a fellow undefeated team. PORTAGE LA PRAIRIE, MAN. — Jocelyn Peterman (Calgary) and Brett Gallant (St. John’s) will enter the final day of the round robin at the 2018 Canad Inns Canadian Mixed Doubles Curling Trials as the only undefeated team in their pool. PORTAGE LA PRAIRIE, Man. — National champions, world champions, Olympians and more. There’s a star-studded line-up at the 2018 Canad Inns Canadian Mixed Doubles Curling Trials, but indisputably one of the most notable teams is the pairing of Jennifer Jones (Shanty Bay, Ont.) and Mark Nichols (St. John’s). PORTAGE LA PRAIRIE, Man. — No lead is safe in mixed doubles curling and that was evident during Draw 7 action at the 2018 Canad Inns Canadian Mixed Doubles Trials. After giving up four points in the first three ends, Nancy Martin (Saskatoon) and Catlin Schneider (Regina) defeated Emilie and Robert Desjardins (Chicoutimi, Que.) 7-6. 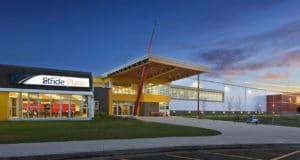 PORTAGE LA PRAIRIE, Man. — As a new mixed doubles pair, Reid Carruthers and Jill Officer had a lot to work out in a short amount of time. But it seems to have paid off as the pair is off to a 2-0 start at the 2018 Canad Inns Canadian Mixed Doubles Curling Trials in Portage la Prairie, Man. But they aren’t the only team with two wins so far. After the first day of competition there are five teams with two wins in the pool.